The decision to highlight only one historic place, rather than the traditional list of nine, supports widespread opposition to commercial redevelopment of the portion of the property that was the location of Greer Stadium from 1977 to 2015. Plans call for private developers to create a mixed used development including housing, retail, and artist facilities while greatly reducing the amount of open green space. Along with many residents and community leaders, Historic Nashville fears that the proposed redevelopment of this internationally recognized historic site would set a precedent that would see the continued loss of both Nashville’s parkland and important historic places. In an event announcing “Nashville One” today, speakers including historian Norman Hill and author Robert Hicks highlighted the significance of Fort Negley as the largest inland fortification built during the Civil War. 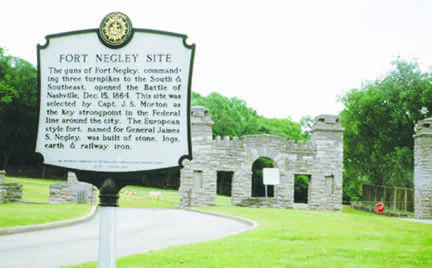 Fort Negley was the center of a ring of fortifications around the city, making Nashville the most fortified city during the Civil War. At least 2,700 African Americans constructed the Union Fort and included slaves impressed by the army and self-emancipated men. Using axes, picks, and spades to construct the fort’s limestone walls, nearly 62,500 cubic feet of stone and 18,000 cubic yards of dirt were used to create the 600 by 300-foot structure. African American women were also impressed to cook, wash clothes, and haul debris in support of the massive construction project. With a lack of shelter and poor food, 800 of these African American laborers living on the hillside below the fort perished within four months due to the harsh conditions. After the Union Army abandoned the fort in 1867, the camp at Fort Negley grew into a sizeable African American residential neighborhood nearby, much of which was later razed to construct the I-40/I-65 interchange. In the early 1900s, Nashville’s Black Republican Party leaders petitioned to restore the fort, but were unsuccessful. Instead, the fort and the level ground—once used by freedmen to train to be soldiers and citizens, then as a burial ground—became a rally grounds for meetings of the Ku Klux Klan. In 1928, the city’s Board of Parks commissioners purchased 47.5 acres with the stated intention “to restore the fort as it was during the Civil War and make the land a public park.” From 1936-1938, the Works Progress Administration rebuilt the fort and the site was opened as park. Falling into disrepair, the park was closed until 1999, when work began to restore and interpret the site. The visitors center opened in 2007 and a Historic Structures Report was completed in 2013 to document the current condition of the fort and identify areas of focus for restoration. Even after the land was finally purchased for a park, in the mid-20th Century, in what was, until now, considered the last indignity to this hallowed ground, this area was turned into segregated ball fields. “Greer Stadium was built here in the 1970s, replacing the old ball fields. When it closed and a new stadium was constructed in Germantown, it was thought that this hallowed ground could be restored and those who worked and died here could be appropriately honored,” said author Robert Hicks. Since 2009, Historic Nashville has published the annual Nashville Nine, a list of the city’s historic properties endangered by demolition, neglect or development. Every year the Nashville Nine is compiled through a public nomination process revealing historic buildings and places that matter to the people of our city. Since the program’s inception, Historic Nashville has brought to the public’s attention a wide variety of the city’s endangered landmarks, including historic houses, parks, civic landmarks, commercial buildings, neighborhood schools, churches, and even neon signs. These properties represent a range of historic time periods, architectural styles, and building types that embody Nashville and Davidson County’s rich cultural history. The Nashville Nine represents historic properties across Nashville in danger of being lost to demolition, neglect, or inappropriate renovations. In 2017, in light of the unprecedented threat to public parkland, the Nashville Nine list was narrowed to the Nashville ONE, highlighting the impending danger to historic Ft. Negley.